Southend, UK, 24th May 2016 – One of Essex’s fastest growing businesses, outsourced contact centre Ventrica based in Southend is delighted to announce that it has won the ‘Contact Centre of the Year’ (larger category) as part of the London & South East Contact Centre Awards 2016 presented at a glittering awards ceremony held at the Heathrow Radisson Blu Hotel on Friday 20th May. Managing Director and founder of Ventrica, Dino Forte commented, “We are absolutely delighted and honoured to win this fantastic accolade. I would like to thank both our wonderful customers for giving us the chance to work with them and also our own incredible team of customer service professionals who have gone above and beyond in their passion and hard work to provide exceptional customer experiences. 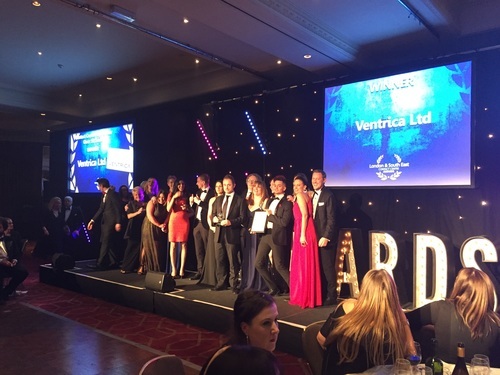 Ventrica is now one of the largest employers in Southend and one of the fastest growing businesses in Essex having experienced phenomenal growth over the last 12 months. By the end of this year it plans to extend its contact centre to 330 seats, with plans to double this to 600+ seats in 2017. Ventrica is a state-of-the art, outsourced contact centre business that delivers omni-channel and multi-lingual customer service and telemarketing campaigns for blue chip brands. Continual investment in globally leading technology allows Ventrica to provide a truly omni-channel customer experience that encompasses calls, email management, web chat, and social media into one integrated and unified solution. Ventrica has significant experience in eCommerce customer management across an array of industries, including Fashion, Retail, Insurance, Finance, Health, Transport, Construction and Publishing. The Ventrica multilingual team provides communication in a host of different languages including French, Italian, Spanish, German, Dutch and Portuguese.